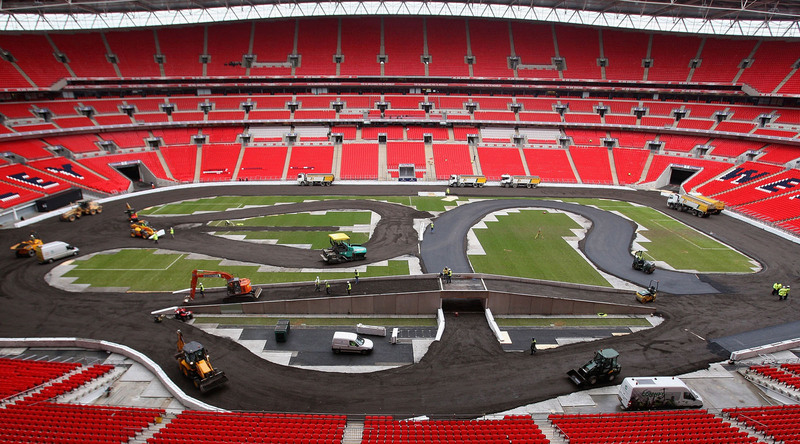 Hallowed Wembley turf turned into a racetrack for Michael Schumacher, Jenson Button and co.
First the NFL circus turns up and makes a right mess of the ‘hallowed Wembley turf’, now it’s the turn of petrolheads. 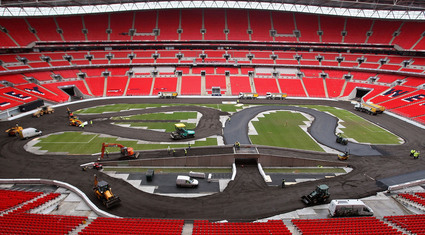 As this photo shows, Wembley Stadium is currently being transformed into a racetrack for the Race of Champions, an annual event that is taking place this year on 16 December. Drivers from different motor sports race against each other, in a variety of cars, including an Aston Martin V8 Vantage and a Ford Focus rally car. Michael Schumacher, Jenson Button, David Coulthard and rally star Petter Solberg are among the drivers set to take part. Perhaps they could also find a seat for out-of-work coach driver Steve McClaren? No, the lasting memory of that night will be the sight of the pitch at the so-called ‘home of English football’ that resembled the Baseball ground from 1972 with American Football markings plastered all over it. Perhaps the FA put two and two together after the home draw with Macedonia, and made as many bookings as they could knowing Wembley would be free for quite some time!